St Dunstan’s School offers a broad and balanced curriculum throughout Key stage 3 (Years 7 to 9) and Key Stage 4 (Years 10 and 11). Throughout, we offer support and guidance to help students follow a pathway that will help them access the next stage of their education. In Year 9, all students are supported in the choice of their options with a consultation evening, a subject handbook and a dedicated member of the Senior Leadership Team. 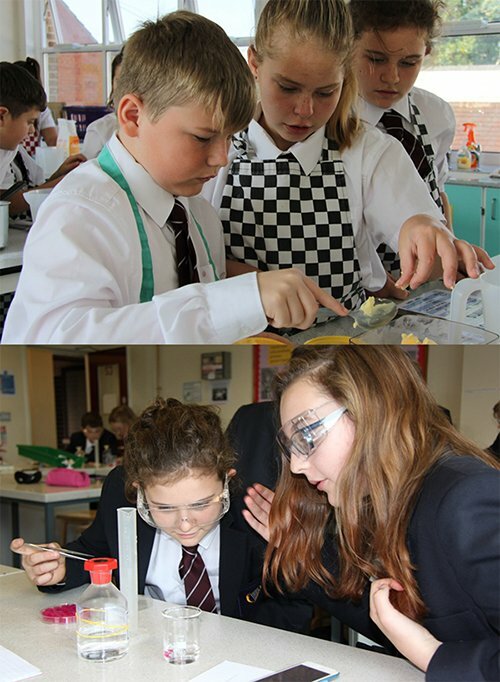 All students have an opportunity to take part in creative enrichment activities in addition to the curriculum, as we believe that these experiences are an integral to improving students’ skills. At St Dunstan’s School we recognise that the personal development of students spiritually, morally, socially and culturally, plays a significant role in their ability to learn and achieve. We therefore aim to provide an education for students with opportunities to explore and develop their own values and beliefs; spiritual awareness; high standards of personal behaviour; a positive caring attitude towards others; an understanding of their social and cultural traditions and an appreciation of the diversity and the richness of the cultures. The school will ensure that students’ SMSC development will take place across all curriculum areas, within activities that encourage students to recognise the spiritual dimension of their learning, reflect on the significance of what they are learning and to recognise any challenges that there may be to their own attitude and lifestyle. This reflection will take place during Curriculum Enrichment days, subject lessons, tutor time and assemblies. acceptance and engagement with the fundamental British values of democracy, the rule of law, individual liberty and mutual respect, and tolerance for, those with different faiths and beliefs; the students develop and demonstrate skills and attitudes that will allow them to participate fully in, and contribute positively, to modern life in Britain. interest in exploring, improving understanding of, and showing respects for different faiths and cultural diversity, and the extent to which they understand, accept, respect and celebrate diversity, as shown by their tolerance and attitudes towards different religions, ethnic and socio-economic groups. Students are given many opportunities to decide which subjects are best for them at Key Stage 4. Tailored sessions are run during tutor time, assemblies take place, an options evening is held and 1:1 sessions are offered with all staff. The school offers clear career guidance by experienced staff who work closely with local higher education establishments by providing information on courses and open evenings. All of Year 11 students undertake a visit to local colleges and get the opportunity to sample numerous appropriate courses. Our two local collages regularly attend parents evenings to offer furthur advice and guidance with additional drop in sessions for our year 10 and 11 students taking place throughout the year. During options evening, the option process is outlined and the students and their parents/ carers are given the opportunity to visit each subject and talk directly to each member of staff. There is also the option of follow up appointments if necessary. Year 9 parents’ evening follows the options evening, allowing another opportunity to discuss potential choices. Students receive two progress reports each year and one full school report. Parents/ Carers also have the opportunity to attend a parents’ evening. The dates for each year group can be found on the notice board section of the school’s website. However, all subject teachers and pastoral staff are available throughout the year to deal with any issues or concerns should they arise. Students are regularly assessed in both key stages. During Key Stage 3 assessment takes place both formally via testing and informally via classwork and homework. For each progress report and full school report, student progress is determined by their progress towards internal targets. Students will be judged using three different grades; P+, making greater progress than age related expectations, P, currently making progress in line with age related expectations, or P-, currently progressing below age related expectations. During Key Stage 4, students are again assessed formally and informally which allows teachers to give them a ‘projected’ grade for each of the progress reports and full school report. This grade will be fine lined to determine the security at which the teacher currently believes that the student is achieving that grade. More details of the fine grading system will be available with the reports when they are issued. Each student is also given a ‘target grade’ for the end of the key stage which is aspirational and should challenge them. All students will have their work regularly assessed via teacher marking. On each occasion, students will be given a challenge to improve one or more aspects of their work. They will then use green pens to indicate where they have responded to this challenge within their work. We work closely with the primary schools to determine the initial setting for all students in each subject. Throughout Year 7 (and in subsequent years) there are opportunities for students to move between sets after we receive Key Stage 2 levels and more assessment takes place. Maths and Science are set together. Any subsequent movement between sets is dependent upon the performance in those two subjects. The rest of the subjects, excluding Physical Education, are set together in mixed ability classes. English is set with History, Geography, History and Philosophy and Belief forming an English and Humanities block. The remaining subjects, excluding Physical Education, are set together in mixed ability classes. In Year 10 and 11, all students will study English, Maths, Science, Philosophy and Beliefs and PE. Students will also opt to study a maximum of four other subjects. These option subjects are displayed in the Curriculum Table. The Department for Education has introduced changes to the grading of exam at Key Stage 4. The A*- G grading system for GCSE has been replaced by a number between 9 and 1. Information on how these grades relate to the previous system are sent out with each of our key stage 4 reports. Vocational qualifications are graded on a sliding scale from a pass to a merit and then a distinction. The measure that the Department for Education will use to judge the success of schools is called Progress 8. This has replaced the 5A*-C which measured the number of students gaining a C grade in five subjects including English and Maths. Instead, Progress 8 tracks how much progress students make from Key Stage 2 to the end of Key Stage 4. This will not affect how the students are taught or which topics they cover in their exams. However, it will mean that schools will need to ensure that all students are making progress across all subjects, rather than focussing on the minority of students on the C/D borderline. At St Dunstan’s we continue to offer a broad range of subjects which gives students the opportunity to study a curriculum containing the EBACC subjects. This enables them to gain a suite of qualifications which are admired by colleges and universities for their robustness and ability to reflect the ability of the students.